Buddhism in Brazil has practitioners of various Buddhist schools, as well as a fair number of somewhat Buddhist-inspired cults and «New Age» movements. Many Japanese schools have a strong presence mainly as a result of World War II, which encouraged emigration of Japanese people. A considerable number of those chose to radicate in Brazil, including teachers of schools such as Soto Zen, Honmon Butsuryu Shu (a Nichiren Buddhism school), Jodo Shinshu (also known as True Pure Land Buddhism) and the controversial Soka Gakkai movement. Buddhist schools of Japanese descent are the most expressive in Brazil, although they face a number of challenges that make their influence somewhat smaller than one would expect. One of those challenges is the mismatch of goals and expectations between the more traditional, Japanese-born people and the native Brazilians (many of them of Japanese descent). Adherence to Buddhism is not particularly widespread among descendants of Japanese immigrants, who are largely Roman Catholic. The descendants that do follow Buddhism tend to display a wide variety of stances regarding their relationships to the ethinicity and the religious tradition. To various degrees most of them attempt to simmultaneously meld with local Brazilian culture according to their personal preferences. As of 2005 most such schools are attempting to become receptive to Brazilians not of Japanese descent, often facing considerable internal resistence in the process. Shingon, Tendai and Nichiren Shu and Nichiren Shoshu schools are also present in Brazil, albeit in somewhat modest numbers. Recent years saw a growth of interest in the practice Zen variants from Korea and Vietnam in Brazil. Theravada school also has Brazilian presence. There are active groups in Belo Horizonte and São Paulo, as well as a Theravada temple in Rio de Janeiro. All four major Vajrayana schools from Tibet have some centers in Brazil — Nyingma, Gelug, Sakya and Kagyu. Particularly, Chagdud Tulku Rinpoche relocated the headquarters of his international organization to Três Coroas, RS, Brazil, where he spent the last few years of his life. 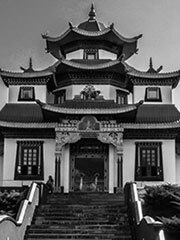 The Chinese Chan school (which gave birth to Zen) gained a major presence in Brazil with the inauguration of the Zu Lai Temple and its companion Buddhist University in 2003. There is considerable Internet activity among Brazilian Buddhists, with a number of websites and mailing lists, as well as Orkut Communities dedicated to clarifying doubts about the Dharma and its practice. Many of those lists and communities are in practice open to various schools and lineages. A few schools and movements are more isolated and do not emphasize dialog with other schools.